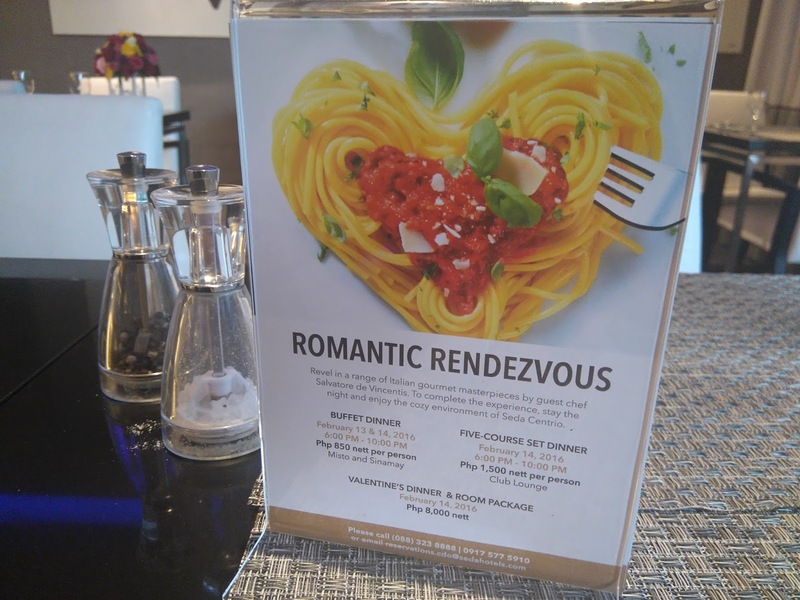 Seda Centrio invites us to a Romantic Rendezvous. On February 13th and 14th Seda Centrio's Misto Restaurant will serve us sumptuous meals not just for couples and group dates. The Buffet Dinner is open from 6pm until 10pm in Misto and in Sinamay Function Rooms. For only 850 pesos net per person, enjoy the full spread of dishes for that romantic date. On a different and more romantic setting on February 14th why not have a Five Course meal with your date for only 1,500 pesos net per person. This romantic date will be set on Seda Centrio's Club Lounge on the 11th floor.The first 12 couples will only get a slot so reserve yours now. For a more complete and hassle free romantic date, why not treat your spouse with a complete date and room accommodation package for only 8,000 pesos. You will not worry how to go home after a heavy meal. From dinner to your room, Seda Centrio will set it for you. Seda Centrio Hotel is located along Corrales Avenue, right in the heart of the Centrio Ayala Mall community. Misto Restaurant is at the 4th floor of the hotel. For inquiries and reservations, please call 088-323 8888 or 0917-577 5910.